I don't know how the hiragana appear on your screen, but on mine they are little squares containing random numbers and letters. All the more confusing. I bow to your brain-power in mastering a language of such complexity expressed in kanji rather than script. (This from someone who attempted Ancient Greek - at least that has recognisable letters.)Amazing. Hmm.... must be language settings on your browser... I didn't think that might be a problem! Still random squares and letters sounds pretty accurate! Japanese is fun, but I don't find it easy. I actually really enjoy the writing system and grammar parts though because they are interesting, whereas learning vocabulary is necessary but just a slog! So, in some ways, it's better than a European language where most of it comes down to work memorisation, since the grammatical routes are closer to English. What you're experiencing is mojibake (changing characters): because not all programs recognize Japanese characters, they come out garbled in some browsers. This is a problem even today for some company and university websites. 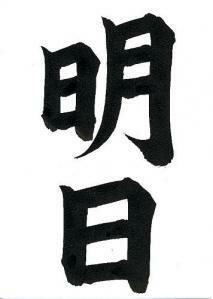 The character "rai" means "to come"; so rai-nen and rai-getsu mean "coming year" and "coming month". For example, the character 米 (bei, or "rice") is used to represent the US. They used to write 亜米利加 for "a-me-ri-ka". (The character 亜, or "a", is not used since it's also used in "Asia.") Often times, you see 米国 in the newspapers to mean "America," 国 meaning "nation." Other prominent examples are 伊太利亜 (I-ta-ri-a, abbreviation 伊) and 独逸 (Do-itsu, abbreviation 独) and 仏蘭西 (Fu-ran-su, abbreviation 仏). The word 明日 literally is written "bright day." Tomorrow is a bright day! The word for the day after tomorrow is 明後日 （asatte, or myougonichi), written "bright day that comes later." Wow -- that's really interesting. I've never seen western country names written in Kanji before -- we always write them in Katakana. "Bright day" is a cheerful outlook. I will try and remember that when my alarm clock goes off tomorrow.